ATTENTION PLEASE READ Photos from the Amateur race and the RCU day have been uploaded. Please remember the photos are unedited .. I purposely took these pictures with out zooming in close because I knew I would not have time to crop them all perfectly.When you purchase prints I take the original photo and edit it by zooming in cropping then touching the photo up like sharpening , brightening and correcting the color so they are perfect for printing. . There just is not enough time to edit each and every photo from Saturday night through Monday. But I can promise you that they will be perfect when you receive them. Also, if you purchase any prints 8x10 or larger I will send you the digital download for free of that photo. Also if the dimensions of the photo will fit in a template Racer X has provided me I will send you a digital download of it. 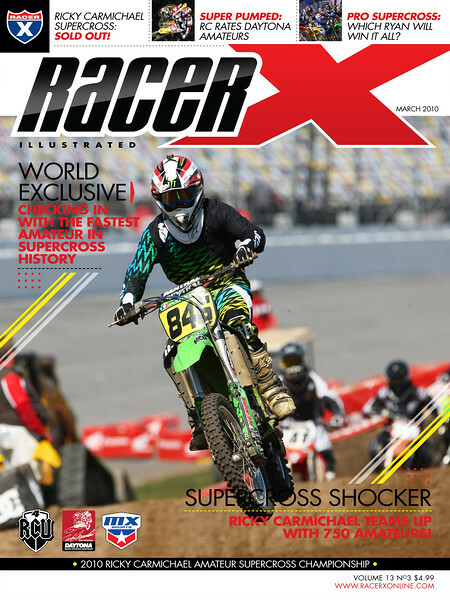 If you want a print of the racer x cover just send me an email and we will work something out. Below is a sample.